The deadline to apply is May 11th! To help achieve the vision that Alaska Native people are the healthiest people in the world, the Alaska Tribal Health System must also be healthy and progressive. The Alaska Native Tribal Health Consortium’s (ANTHC) Board of Directors established a fund to offer 10 $5,000 educational scholarships to qualified Alaska Native and American Indian students, including our staff, who are interested in health care careers. ANTHC will accept applications until May 29, 2015. Awards go towards the academic Fall 2015-Summer 2016 school year. This scholarship may be used for tuition, books, and fees for professional certificate programs or higher education degrees (Associates, Bachelors, Graduate and PhDs). Click here to open the application instructions. Click here to open the 2015 scholarship application. If you have questions regarding the scholarship, please contact Josh Patton, HR Manager, at extension 1333, via email at learning@anthc.org or visit http://bit.ly/16cJouF. While most parents and students are just thinking about getting back to school, high school students should always be thinking about applying to as many scholarships as possible. The more money that can be earned through scholarships means less loans to pay back later. The YLCC program provides paid summer internships to highly accomplished graduate and upper-level undergraduate students to work on diverse issues related to climate change and its effects in national parks. The internship projects may occur in national parks or program offices and are designed by National Park Service (NPS) staff to meet high-priority needs of parks and programs. General topic areas include resource conservation and adaptation; climate effects monitoring; park facilities adaptation; policy development; sustainable operations & mitigation; and communication, interpretation, or education. 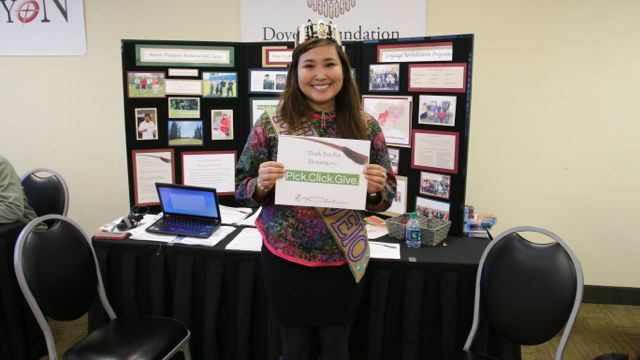 This year, 81 donors pledged a total of $5,625 to support Doyon Foundation scholarships through the Pick. Click. Give. program! From all of us here at the Foundation, thank you for your generosity. View our Pick. Click. Give. photo gallery! Overall, $3.3 million was raised for Alaska nonprofits through Pick. Click. Give. this year – a new record for the seven-year program. Donations to the Foundation were up as well, from $5,475 in 2014 to $5,625 in 2015. Although the 2015 PFD application period has closed, it’s not too late to make a Pick. Click. Give. contribution. Simply visit the PFD webpage and click the “add or change your Pick. Click. Give. donation” button on the right-hand side of the page. When you Pick. Click. Give. to Doyon Foundation, you are supporting the future – the future of current students like our 295 spring scholarship recipients, the future of our children like Caleb Xavier Abraham Smoke, and the future of our communities, state, nation and world! Caleb is an excellent example of the importance of supporting our future. When his mom asked what he wants to be when he grows up, Caleb said, “A police officer to protect and keep us safe.” Perhaps one day Caleb will be the recipient of a Law Enforcement Academy scholarship! Donations received through Pick. Click. Give. go to the Foundation’s general scholarship fund, which awards basic scholarships to part-time and full-time students. During the 2013 – 2014 academic year, we awarded 523 scholarships totaling more than $408,000. For more information on Doyon Foundation and opportunities to support students, please contact us at 459-2048 or foundation@doyon.com. Please see the below information regarding summer internship opportunities at Chugach Alaska Services. Northern Air Cargo is now accepting applications to hire several Full Time Terminal Agents in Anchorage, AK. For more information, or to apply, please go to the Job Board.